Imagine using the GC medium to tell a story built upon classic fairy tales but with the added twist of making pop-culture references all along the way to spruce things up. What’s that? It’s been done in the Shrek series and all of its spin-offs? Then again in the Happily Never Afters? And again in Henson’s Unstable Fables? Okay so The Seventh Dwarf gets no points for originality. It does, however, stand upon its own merit in a genre one would suspect to be already pretty well tapped. 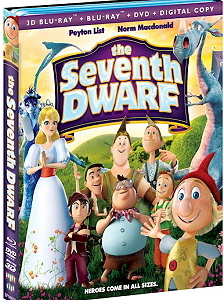 The Seventh Dwarf (German: ”Der 7bte Zwerg”), is a German 3D computer-animated film, created in 2014. It was released in cinemas on the 25th of September 2014 in Germany and on July 31, 2015 in the United States as a direct-to-DVD affair from Shout! Factory. 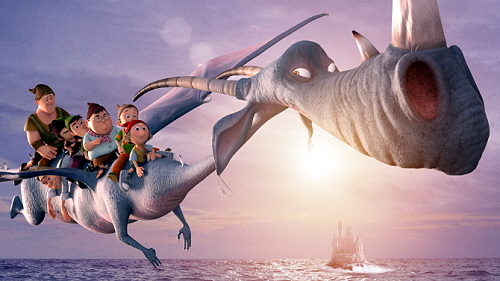 The movie is based upon the fairy tale Sleeping Beauty and characters from Snow White and the Seven Dwarfs and while younger audiences will recognize the source material’s influence, it should be noted that this isn’t your Bashful, Dopey, and Doc from Disney dwarf fame; no here we have dwarfs by the name of Cloudy, Sunny, Cookie and Bobo to mention a few. In fact, while it is based upon the famous Brothers Grimm tale, the material for this one serves as a sequel to the films 7 Dwarves – Men Alone in the Wood (2004) and 7 Dwarves: The Forest Is Not Enough (2006). Not to worry if you haven’t seen either prior to going in to this one, it’s all pretty straight forward stuff. In the castle Fantabularasa the time celebrate the 18th birthday of Princess Rose, who has been cursed by the evil ice fairy, Dellamorta, has arrived with great fanfare. Of course everyone knows looming overhead throughout the festivities is a spell that states if she gets pricked with a sharp object before midnight, the whole kingdom will sleep for one-hundred years. Thus, and in typical fairy tale logic, the princess is required to wear armor day and night until her 18th. Everything goes according to plan until clumsy Bobo, the seventh dwarf, makes the type of mistake that allows Dellamorta’s spell to be fulfilled. Only by a kiss of true love the curse can be reversed, but Dellamorta knows a thing or two about how these things tend to play out and captures the kitchen boy, Jack, who loves Rose. With the help of a dragon named Burner, the dwarves search for the “Prince Charming” who can save the land. It may not be the world’s most original take on some classic material but in all fairness, The Seventh Dwarf feels less like a rehash than it does a pretty fun take on the source material. Directed by former Disney character designer Harald Siepermann (who sadly, passed away during production), and built upon a screenplay by Daniel and Douglas Welbat, the end result here is a film with a few memorable moments that can never quite pull it all together into the type of butter-smooth narrative we’ve come to expect from studios like Blue Sky and DreamWorks. The truth of the matter is many of the Brothers Grimm originals contain a good deal of material parents would find highly objectional by today’s standards. One really can’t fault The Seventh Dwarf for including unfriendly concepts such as a dragon contemplating suicide after having been laughed at or the sheer skintight gown of Dellamorta that hints toward some anatomical correctness in the chest region. But parents should be advised such things are present before showing it to their kids. Pacing is tighter than expected; with a multitude of fairly well done musical numbers scattered about to capitalize on fans of Frozen. The story is a fairly by-the-numbers affair with a couple of nice touches thrown in for good measure (like the angle of Bobo learning how to tie his shoes as a means of warding off calamity for example). Another segment that elicits some genuine laughs comes in the form of a pair of Mermen rappers with a hit video on YouTube. The visuals are a bit of a mixed bag as well- some of the background textures are rich and well lit but the character animations themselves are often overly simplistic and lack any sort of emotional depth. The English dub (featuring the voices of Peyton List and Norm MacDonald) is solid enough to match the visual appeal of the piece; all in all neither impressive nor offensive. In conclusion I often joke that going into this one I expected a train wreck but all I got was a simple derailment. The twisted fairy tale is nothing new in CG (in fact DreamWorks’ Shrek was one of the earliest major players in the genre), but it is nice to note that a modestly budgeted German film can come to the domestic table with a few fresh tricks up its sleeve. It doesn’t happen often but every now and again a CG animated feature film comes onto the scene without much hype, promotional budget or even the involvement of a major studio yet still manages to display mastery over the art. Such is the case with StudioCanal’s Thunder and the House of Magic. You may not have heard much about this one but that is no reason to avoid giving it a look. What it lacks in hype, it more than makes up for in heart. 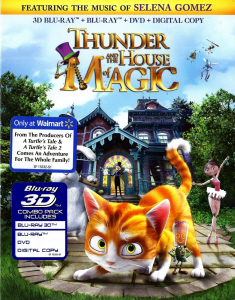 The House of Magic (Thunder and The House of Magic in the United States) is a 2013 3D Belgian-French computer-animated film that clocks in at 84-minutes and enjoyed a global release. Here in the United States, distribution was handled by Shout! Factory and believe it or not, it did get a modest theatrical run before making its DVD debut. It was built off a budget $34-million and thankfully did not depend on its USA gross (where it took in an abysmal $4,091) to be profitable. On the global scale it fared much better; $64,197,205. The story tells of an abandoned tabby who seeks shelter in a ramshackle mansion believed by the local animals to be haunted. Instead, it turns out to be the home of elderly, semi-retired magician named Lawrence, who shares his living quarters with some of the animals he uses in his performances as well as a litany of sentient toys. The animals living on the premises are none-too-quick to welcome another critter into the fold and a good portion of the beginning of the film is dedicated to Thunder’s trials and tribulations from being first abandoned by humans and then rejected by his fellow-animals. All is not bleak, however, as Lawrence (Doug Stone) is depicted as a great admirer of cats and manages to integrate humble Thunder into his routines in short order. 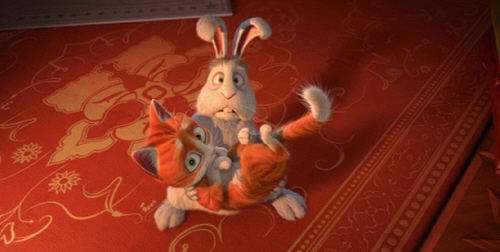 While he’s accepted by the house’s rightful owner, alpha rabbit Jack (George Babbit) and his mouse partner-in-crime Maggie (Shanelle Gray), still plot to evict the cat from the premises. It’s only after an accident puts poor Lawrence in the hospital that the feuding animals must unite to keep the property from being sold off by Lawrence’s real-estate-agent nephew Danny. If this all sounds a little light on plot, it is but this is one of those truly rare, rare films that manages to exceed its plot limitations by simply being charming in all the areas that count. The visuals are crisp, the textures rich and diverse and the animation simply beautiful. So much so in fact that you’ll marvel at all of the personality they’ve managed to capture in silent characters, like a little light-bulb -headed toy named Edison. Younger viewers will enjoy the ride but not simply because its a bright animated piece but because everything here just sort of clicks perfectly into place. Some of the action sequences are loosely reminiscent of the climax of the first Home Alone but this isn’t to be mistaken for relying upon visual gags to be humorous either. The characters are memorable, their cause worthy and the subliminal technical aspects of the production (vocal performance, mouth animations and scoring) are all top-notch; easily on par with some of the best coming out of Hollywood. In conclusion, Thunder and the House of Magic joins a very select group of CG animated feature films like A Monster in Paris and The Book of Life where budgetary restriction and a lack of industry-hype cannot restrain the passion and vision of the artists involved. Sometimes a film comes along and manages to dazzle so thoroughly that it really reminds its viewer of the magic and charm possible in the whole “motion picture” concept. For me A Monster in Paris is precisely such a piece. Despite oodles of hype associated with it since its initial release back in 2011 and fairly high expectations going in, I enjoyed every frame of the film and am left with renewed vigor for the unbelievably time consuming art of crafting quality CG. 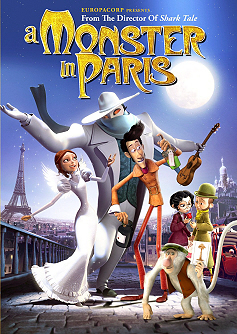 A Monster in Paris is a 2011 French 3D animated musical adventure film directed by former DreamWorks director Bibo Bergeron based on a story he wrote. Coming in at 87-minutes in length and wearing an appropriate PG rating (for some action-heavy scenes and gunplay), the film moves along briskly atop a beautiful soundtrack featuring the vocal work of Sean Lennon. The story, which has been criticized for its sheer oddity, tells of a small group of cohorts in Paris circa 1910, shy and insignificant Emile (Jay Harrington) and his pal Raoul (Adam Goldberg) who inadvertently create a gorgeous-voiced monster by messing around with a professor of botany’s litany of laboratory potions. Oblivious to the panic they’ve caused, reports begin surfacing of a monster terrorizing the citizens of Paris. In time we discover that the monster isn’t quite the malevolent creature the media is portraying when he encounters stage performer Lucille (voiced by the absolutely luminous Vanessa Paradis). All the while the city commissioner, one Maynott (Danny Huston) sees opportunity to win over the public’s affection (and hopefully votes) by slaying the monster. Sure it’s a bit unique from a traditionalist sense, the story is actually a lot less convoluted in its delivery than it sounds in summary. In fact, there are many small details integrated throughout that suggest mastery over the art of exposition (like one where the viewer actually witnesses the transformation and initial confusion through the eyes of the monster itself). The animation and visual work, while nothing overly flashy or gimmicky, can be quite magnificent at times; particularly the soft hues and lighting that never allow the viewer to fully lose touch with the era of the piece. The vocal cast is absolutely top notch; delivering performances that are spot-on for the emotions of the characters and as if their acting delivery weren’t solid enough, the musical numbers (something I typically despise in contemporary animated films) are brilliant. This could be one of few examples in the CG animated feature film segment where care in assembling a vocal ensemble went far beyond simply putting together a host of A-list celebrities in the hopes of their mere involvement boosting ticket sales. 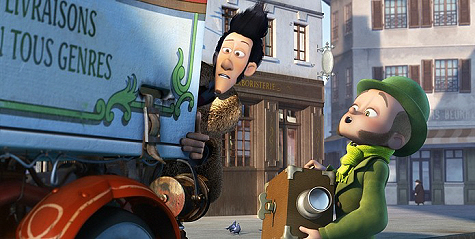 The true heart of this tale is encapsulated in character interaction; beginning with the opposite mentalities of Emile and Raoul (which harkens back to some of the finer moments between Tulio and Miguel in prior Bibo Bergeron film The Road to El Dorado) and progressing to the interesting dynamic between Lucille and The Monster itself. In the end, all of my acclaim for the piece is not without a few minor caveats. First, the film doesn’t particularly bend over backward in terms of cuteness, slapstick or other such gimmicks to hook younger audience members. Rather, most of the humor here is classy and dialog oriented. I personally am a fan of this approach, as an adult who has been forced to slog through countless mind-numbing animated films that keep youngsters entertained only through visual gags and cheap laughs. This one will appeal to adults first and foremost, with kids likely becoming bored about midway through. Though in all fairness there are charming elements like a sign-wielding monkey and a gadget-laden jalopy to break up the dialog-heavy sequences. It is very reminiscent of the type of sophistication in children’s storytelling common in the 1980s 2D era (think An American Tail or Secret of the Nimh) but with far quicker pacing sensibilities for this ADHD generation. My second complaint comes in the fact that both the blu and DVD release of the film are as absolutely bare-bones as it gets: No behind the scenes, interviews, commentary tracks, nothing. There is a trailer, some setup options and the feature itself. If, like me, you usually enjoy exploring the personalities, inspirations and aspirations of the individuals behind the magic, be forewarned that very little exists of such things on the net and absolutely none on the disc. All told, I thoroughly enjoyed A Monster in Paris despite fearing that a film about a signing monster bopping around turn-of-the-century France would never fall under my personal definition of cinematic brilliance. What I came away with, however, was an appreciation for all of the subtleties and abundant attention to detail that make this one a most worthy example of how effectively the CG animated medium can be used to tell a character-driven story.